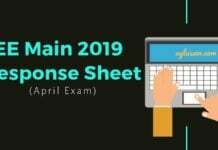 JEE Main Application Form Correction 2018 – CBSE has started JEE Main 2018 Correction in entered details and uploaded images. The correction facility began today, on 09 January, and the last date to make the changes is 22 January 2018. The correction window is only available online, at jeemain.nic.in, and the link to directly access it is given below. The editing cannot be done via any other medium. 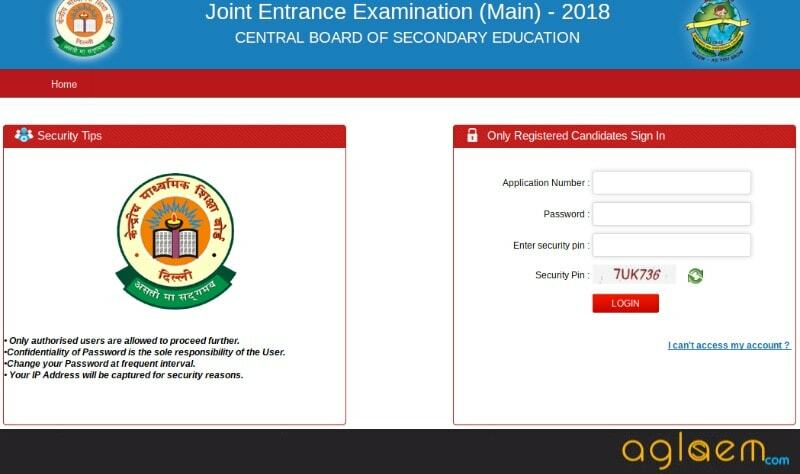 To access the JEE Main 2018 Application Form Correction window, candidates need to enter Application Number and Password. All the details in the application form can be edited but the mode of the exam cannot be changed from Computer Based to Pen and Paper. Extra application fee, if applicable due to the editing of details, is to be submitted via online or e-challan mode. The facility for JEE Main image correction is also available. Check more information on JEE Main Application Form Correction from this page. Click Here to Remove Discrepancy in Uploaded Image(s). 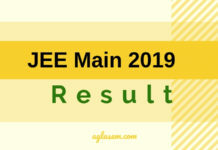 While JEE is a national level exam, there are other university level engineering entrance exams as well. Applying for them increases your chances of getting admission in prestigious institutes. Along with JEE Main, the candidates can also use the link below to apply. MU OET 2018 for Manipal University B.Tech Admission – Apply Now! Click on the appropriate link provided above or seek the correction link on the jeemain.nic.in. 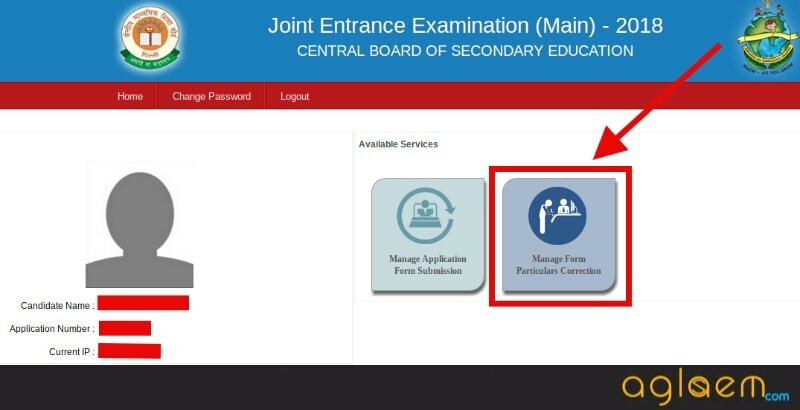 Access the JEE Main Correction Login by entering the Application Number and Password. Check the entered details and click on the ‘Login’ button. Now the window as shown below will open and you need to click on “Manage Form Particulars Corrections” to make the changes. The candidates have paid the fee amount. And has complete all the steps required for submitting the application form. Yes, there is one thing that the candidates cannot change. As stated above, the candidates can change the mode of exam from Pen and Paper to Computer Based but CANNOT change the mode of JEE Main from Computer Based to Pen and Paper exam. 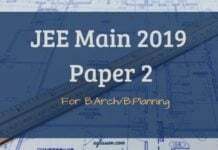 If the candidate earlier opted for one Paper of JEE Main 2018 but now they want to apply for both, then they will be required to pay the application fee for another Paper as well, as required. 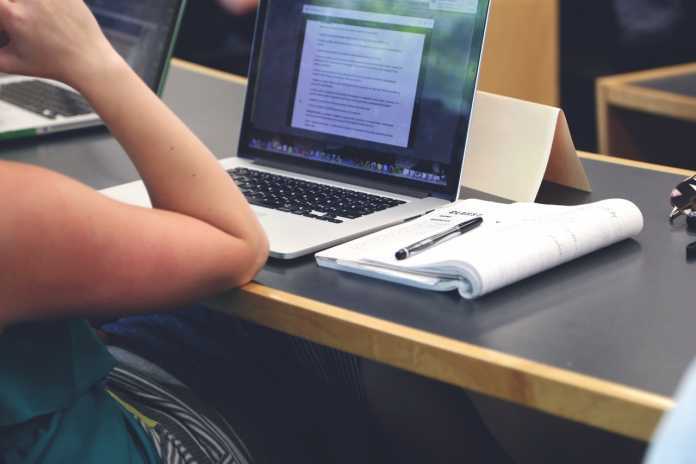 Calculate fee for your category and mode of exam from – here. Fee will not be refunded in any case. Mode of Payment – The fee amount can be paid via Credit / Debit Card, E-wallet of SBI Buddy / Paytm, and E-Challan of Syndicate / Canara / ICICI Bank. Note: The candidates can take help from professional to correct the size, dimension, or file format. It is better to ensure that the Photograph should contain the Name and Date of Capturing on it. In the photograph, the frontal face of the candidates should be clearly visible. Red eye, glare, hat, caps, etc are to be avoided in the photograph. The signature is to be done properly on a white sheet with a Black or Blue pen. How to Revome Discrepancies in Images Uploaded with JEE Main 2018 Application Form? Precaution is better than cure but if the images have already been uploaded incorrectly then the candidates can follow the steps below to make the corrections. Access the link provided above or go the official website and navigate the same link there. 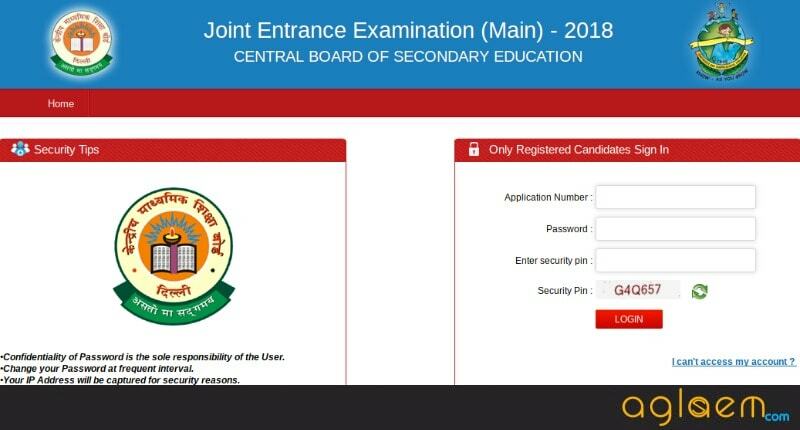 The image below shows how the JEE Main 2018 image correction login looks like. To open the login, the candidates will have to enter the Application Number, Password, and Security Pin. Once all the details are entered correctly, click on the Login” button and make the corrections in the image/images. Below we have discussed few common queries which boggle the mind of candidates. Q. Can Aadhaar Number also be Updated? A. Yes, unlike last year, the candidates will also get the opportunity to edit Aadhaar details in the application form. Q. By mistake I have submitted more than one application form. Will it cause any problem? Q. When I applied for JEE Main 2018, the class 12th roll number was not allotted to me but it has been allotted now. What should I do? A. Mentioning the Roll Number of Class 12th is not mandatory while submitting the application form but if it has been allotted to you then it is advisable that you add it, using the JEE Main Application Form Correction Window 2018. Q. I have applied for Paper 1 and 2 of JEE Main but I do not wish to appear for Paper 2. How can I apply for the refund of fee? A. 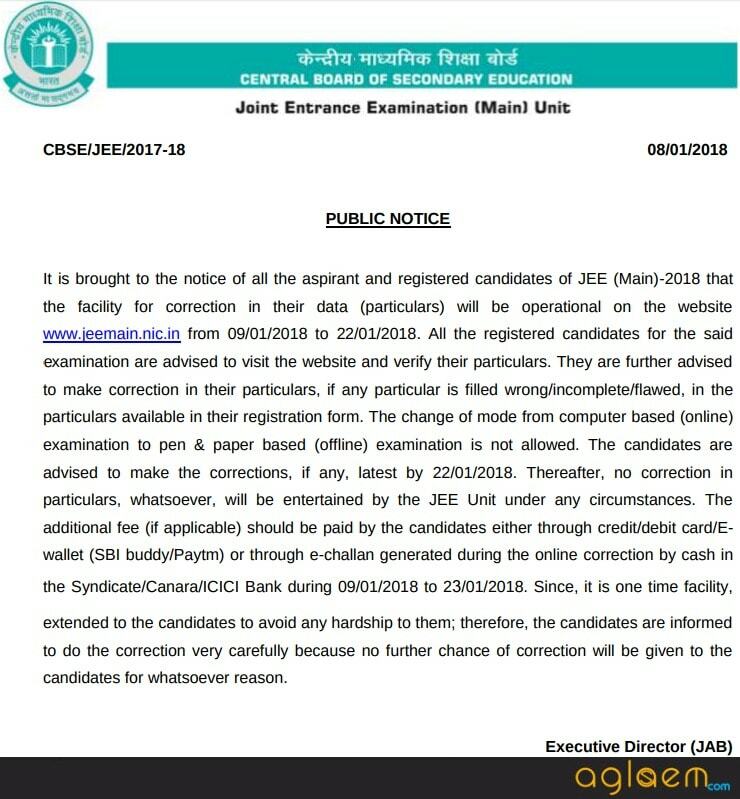 The candidates may or may not appear for the examination but the application fee of JEE Main 2018 is non-refundable in nature. Q. I was not able to book the date for online examination after paying the fees. Now how will be the date and session determined? A. In this case, the exam date and slot will be assigned randomly. The details of it will be informed by the admit card. Note: If in case candidate want to send individual query, then they can email to JEE Main official email ID. If candidate is sending email regarding their application form correction then they have to mention the name, application number and the mistake committed and the correct details which has to be filled. If you have any queries regarding JEE Main 2018 Application Form Correction, please ask in comments below. I wrongly updated my CBSE board Registration number in JEE . Also I downloaded the JEE admit card. Is is possible to correct my CBSE board Registration number? sir , this is lakshman …….? recently i got the message that to correct your all details ……..? if i am opening that my account …………………….it is saying that your account is in valid ……? i wrote wrong annual income of my father.Can it be updated? i wrote my category wrong can i change it?? i wrote 10th passing year wrong can i change it?? yes you can change it when the edit option will come. I havent written my name and date on the photograph which i have uploaded.. can i change it too? i have registered for jee mains but during log in process for correction of my form it the application number is showing as invalid. hpw can i correct my details now if it is showing invalid..?? Can i change paper 1 to both paper 1 and paper 2 ?? ?how much it will take correction fee as i have already given 500 rupees during registration in paper 1???? Yes,you can change to both the papers but you will have to give some extra fees which is for paper 2. I put my initial (B.) before my name, is that wrong? Will they reject my application?